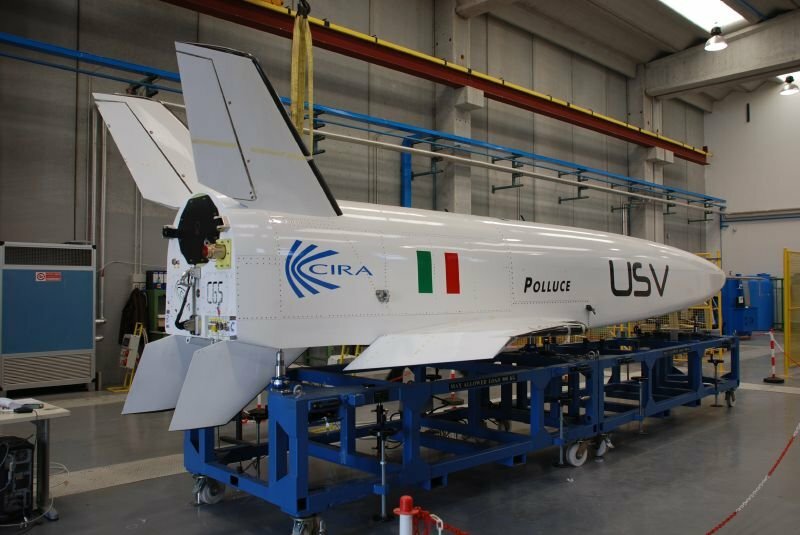 The PRORA-USV program was conceived in 2000 and started two years later under managment of the Italian Aerospace Research Center (CIRA) to design and manufacture two identical unmanned Flying Test Beds (FTB) named "FTB-1 Castore" and "FTB-2 Polluce" conceived as multi-mission flying laboratories. These vehicles are key pieces to test and verify advanced functionalities and critical operational aspects of a future Reusable Launch Vehicle (RLV) intended for orbital space missions. To reach the project's goal CIRA built not only the two FTB's but also developed several methodologies and tools in the field of meteorological forecast and prediction and optimization of balloon trajectories. The entire system of the FTB is constituted of a carrier subsystem (the stratospheric balloon) whose function is to drive the vehicle to the desired altitude (thus acting as a virtual "first stage" of propulsion), the transporting gondola and the vehicle itself. A close view of the gondola and the vehicle can be seen in the image at left (click to enlarge). The gondola used to hang the FTB is called "StratoLift" and was developed specially for this mission by the Italian Space Agency. It hold not only the model to be dropped but the telemetry and communications equipment and CIRA's avionics as well all the electrical and mechanical equipment devoted to control and monitor the FTB during the initial climb under the balloon to float altitude. Also are located in the gondola several balloon subsistems like the control of the valves located in the apex of the balloon for venting gas and the ballast container. 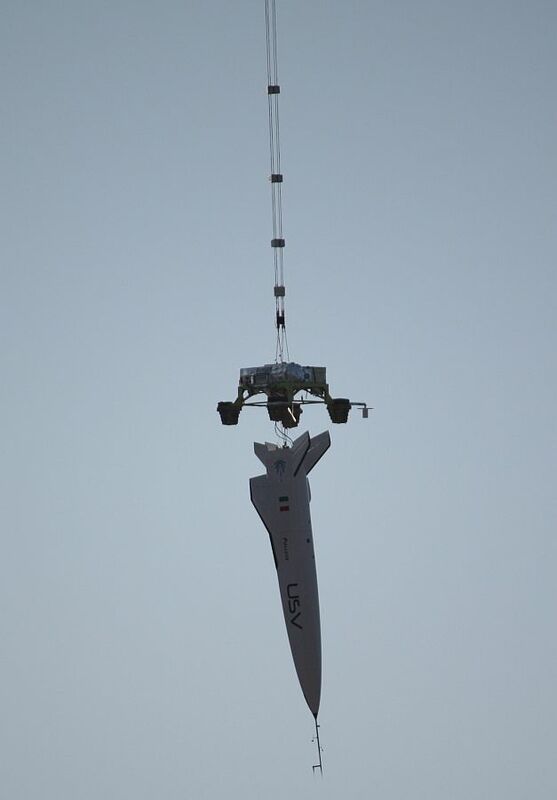 The gondola is connected to the bottom of the balloon throught a parachute, whose purpose is double: to insure a safe termination of the mission in the case of any emergency and the safe descent of the gondola once separation from the vehicle has been accomplished. As the mission is planned to be performed on the open sea, the gondola is equiped with self inflatable floats to prevent the sunk of the structure. The FTB demonstrator plane is a slender, non-propelled, winged vehicle measuring 9 meters long and with a total weight nearing 1.3 ton. It is able to perform experiments on structure and materials, autonomous guidance navigation and control (GN&C) and thermo-aerodynamics in two flight configurations one in sub-transonic regime and one in supersonic regime. Inside the aerodynamically shaped hull there are located all the subsystems necessary to control the craft: hydraulic manouvering system to control the attitude of the craft wjile dropping, a three stage parachute to brake the FTB before splashdown in the sea as well other systems like thermal control, electrical power, data handling and telemetry, tracking & command. The FTB can accommodate onboard a scientific payload denominated as Passenger EXperiment or PEX. 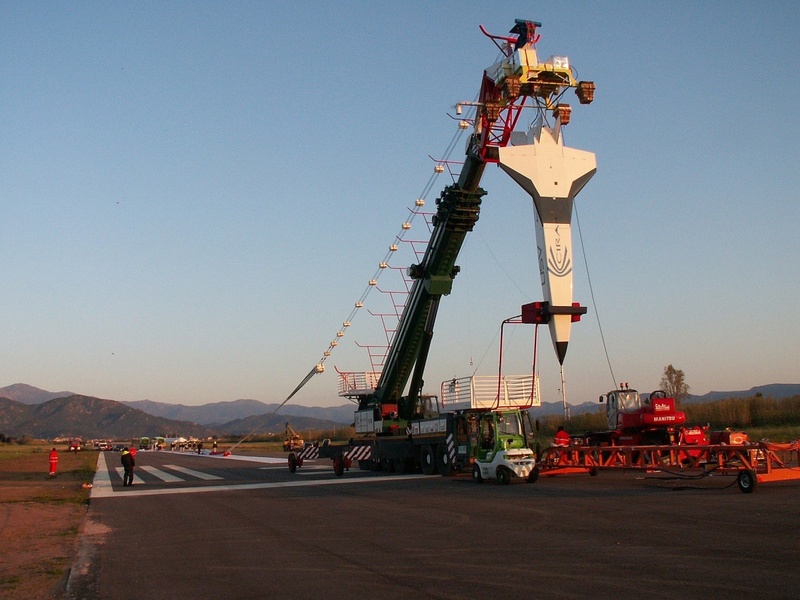 The tail is formed by four vertical fins to reduce interference with wings, with parachute at deployment, and structural constraints, as well as to match stability and control requirements. The FTB main structure was constructed by Carlo Gavazzi Space SPA and several subcontractors while the flight mechanics hydraulic system was responsability of Alcatel Alenia Space. The onboard avionics and control software were developed by Techno Systems and Space Software Italia respectivelly. The vehicle is mechanically linked to the gondola and is separated at the moment of the ejection by means of a pyrotechnique device. 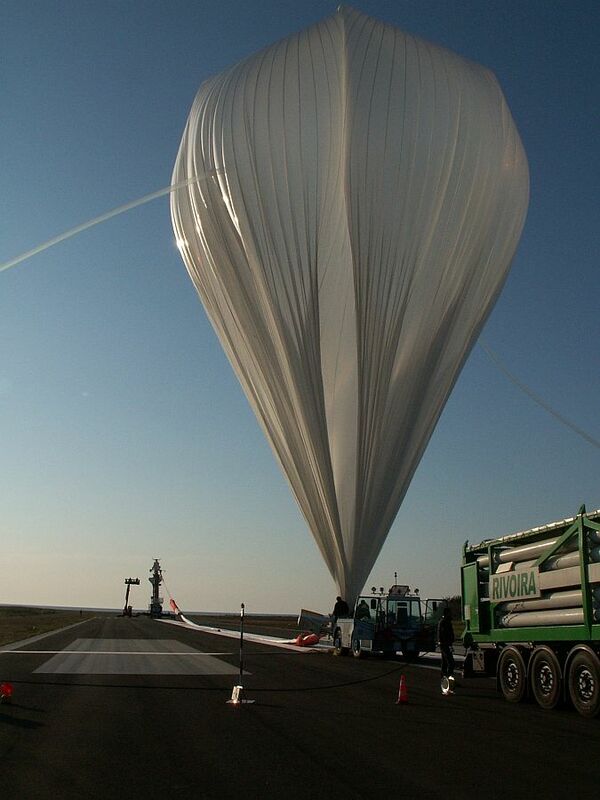 The model was transported by a stratospheric balloon launched from the Tortoli-Arbatax airport in Sardignia at 8:45 local time on April 11. The launch window was opened in January, but adverse weather forced to cancel the test several times. The launch operation proceeded flawlessly: after finishing the inflation process, the balloon (measuring 340.000 cubic meter of volume) was released, elevating the space plane model in a slow ascent while at the same time the prevailing westerly winds pushed it out to sea. About an hour after launch the balloon reached float altitude of 24 km, and entered in a no fly/no navigation zone under the control of the Poligono Interforze di Salto di Quirra (PISQ). There, at aproximately 10:15 the USV was released. After a fall of 140 seconds, the parachute opening sequence began which led the plane to a safe splash down in the Ocean 10 minutes later. After completion of the free fall phase, the balloon, still in flight, was terminated and the gondola that served of "hook" for the USV vehicle was separated from it, hitting the ocean surface under his own parachute at 11:10. The next phase was the recovery of the plane which was performed by the Italian Military Navy using the ship "Tavolara" which picked up the USV from the Ocean at 17:30. Unlike occured in the first mission in 2007 when the twin vehicle "CASTORE" broke apart at splashdown, this time "POLLUCE" was found completely undamaged and fully functional. The objective of this second mission was the acquisition of flight data in a phase particularly critical and deserving of further study: the trans-sonic flight. 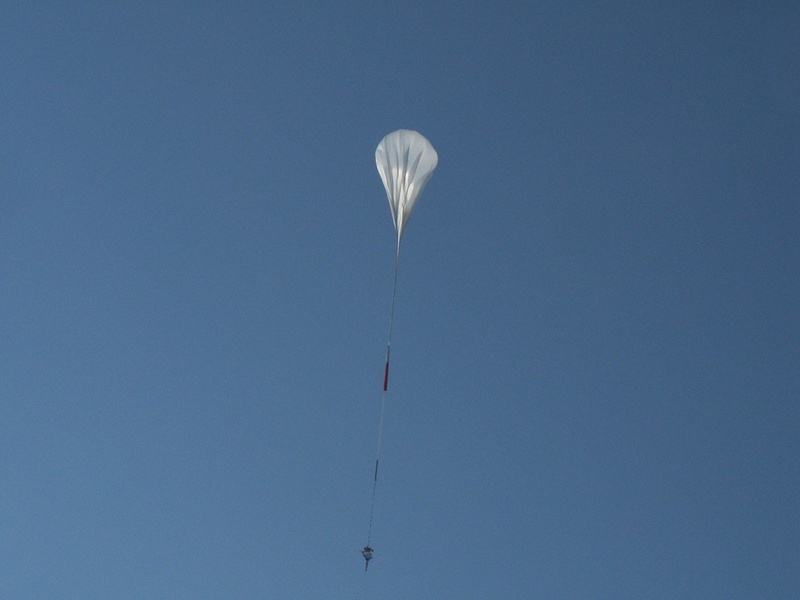 After release from the stratospheric balloon, the vehicle performed a pitch-up manoeuvre to reach and hold a specified value of the angle of attack while accelerating up to Mach 1.2 at about 15 km altitude; then a pull down manoeuvre was performed to keep the Mach number constant while a sweep in angle of attack was executed. The manoeuvre allowed the verification of the aerodynamic behaviour of the vehicle at constant Mach and variable angle of attack in full transonic regime as it would happen in a wind tunnel facility. At the end of this manoeuvre the vehicle began a pull up manoeuvre to decelerate to very low speeds (below Mach 0.2) and reached an altitude lower than 5 km where a subsonic parachute was opened, allowing a safe splashdown of the vehicle. Also were included two scientific experiments one onboard the USV which consisted in the use of a MEMS (Micro Electrical Mechanical System) based sensor device to record acceleration data during USV flight and splashdown phases and the other mounted in the "Stratolift" gondola called IRIS Project was designed by some high school students in Puglia, and was aimed at detecting the opacity of the atmosphere related to the presence of aerosols. Identification from Flight Data of the Aerodynamics of an Experimental Re-Entry Vehicle chapter 8 of the book "Advances in Modeling of Fluid Dynamics"